Will an Avengers 4 cameo bring a pair of brand-new superheroes into the MCU? Captain Marvel might not be the only cosmic superhero making an appearance in Avengers: Endgame. That is, if this cameo rumour is to be believed. The unverified whispers would set up a big MCU Phase 4 movie, as well as introduce us to two new faces into the fold. In short, the Marvel universe could be about to get whole lot bigger. These reports come from DanielRPK on Twitter, who has a pretty decent track record when it comes to all things Marvel. Still, plans can change and there will still be shocks a-plenty, I’m sure. After all, who would’ve guessed Gamora would’ve been chucked off a cliff or Aaron from The Walking Dead season 9 would be playing the new Red Skull in Avengers: Infinity War? Even so, be wary of possible spoilers below. Say hello to The Eternals. We’ve covered the possibility of it being a Phase 4 movie before, but there’s a problem: These beings who have been around for hundreds of thousands of years and are practically immortal might not fit snugly into Marvel canon… or could they? It’s now rumoured that two of the Eternals, the tricksy, childlike Sprite and Karen, which could be a cover-up identity for an Eternals character, will appear in either Avengers 4 or Captain Marvel in some fashion. In fact, DanielRPK reckons the post-credits scene is the most likely place for an Eternals debut. It makes sense: they’re given their own space to be introduce but, like so many MCU movies before it, the post-credits scene can also act as a tease for an upcoming movie. Heck, they may even save the day from Thanos or be tied to those brand-new Avengers 4 villains we keep hearing about. There’s always the danger of Avengers 4 getting too over-bloated, yet many said the same about Infinity War, which balanced (pun absolutely intended) things terrifically. As of yet, there’s been no official confirmation from Marvel about the Eternals, nor is there likely to be for some time yet. 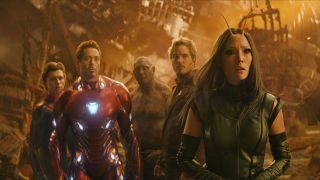 But Avengers 4 could be the first time they show up – and we could also be witnessing ground zero for the dawning of a new era in the MCU.